Your wedding day: The most beautiful, memorable, special, stressful, overwhelming, and down right frustrating day of your life. One decision that will alleviate a ton of stress on your special day is allowing South Florida Transportation to provide a wedding party bus rental to transport your wedding party when and where you want them to be. Wedding parties on average consist of four bridesmaids and four groomsmen, a maid of honor and a best man; you can’t forget the flower girl and ring bearer. Then the mother and father of both the bride and groom and God willing their grandparents, as well. That is a lot of people to keep up with and to keep on track. 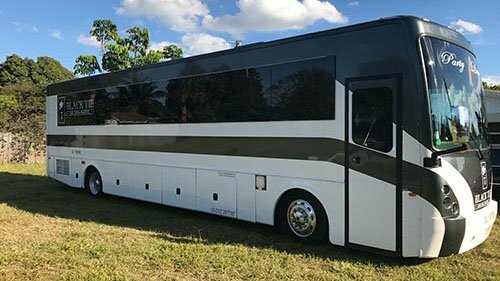 When you allow South Florida Transportation to put your wedding party in our party bus rental you can be assured everyone will be where they are supposed to, when they are supposed to. Now that the worries have been eliminated you can start having some fun. Your wedding is a once in a lifetime experience and should be fun and memorable from beginning to end. Imagine your entire wedding party comfortable relaxing inside their exclusive party bus, champagne glasses being passed around and topped off. You get to start your day with with a beatiful toast surrounded by people you love. Every member of your wedding party there to support the two of you instead of having to worry about time, transportation and their own dependants. The photo ops alone are worth having a wedding party bus rental. When you have a wedding party bus rental you’re not limited to taking photos where the ceremony is to take place. You can go to the beach, then to a landmark, go downtown, or your favorite park. Having proper transportation for everyone allows you and your photographer to be as creative as your imagination will allow without being hung up on the logistics that would otherwise make it impossible. After the beautiful ceremony and the receiving line, it’s time to get the wedding party all set up at the reception. How great is it to know your entire wedding party is in place before the DJ announces the new Mr. And Mrs. entering the room for the very first time. Of all the decision-making that comes with getting married, having a wedding party bus rental is a no-brainer. Another no-brainer is allowing South Florida Transportation to deliver the impeccable service they are known for. 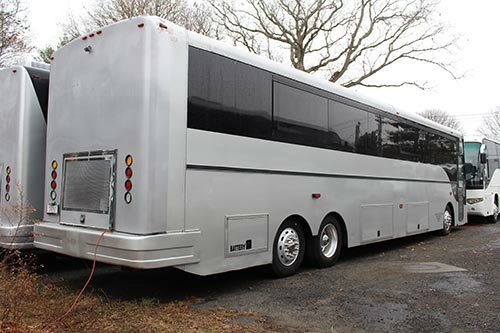 Their large Fleet allows you to pick a wedding party bus rental that fits your needs and your budget. The drivers are courteous, well-trained, professionals there to see to your every need. This will be your easiest decision, after I do. Previous post Bachelorette and bachelor party bus rental	Next post How much should I tip my limo driver?